Following a week of flooding rains, it was nice to see “Rays of Sunshine” provided by the fitness superstars who participated in the 2013 National Fitness Hall of Fame Induction Ceremony. 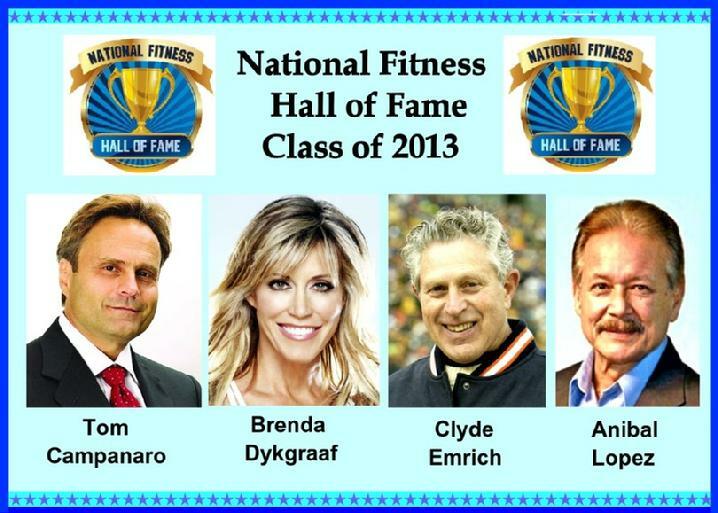 Induction into The National Fitness Hall of Fame is the highest honor a fitness professional can receive and those present certainly embraced the moment. After dinner was served by the terrific staff at the Glendale Lakes Golf Club in Glendale Heights, Illinois, the ceremony commenced with Hall of Fame founder John Figarelli presenting the “Volunteer of the Year” award to Walt Sloan. For several years, Walt has provided various support for the Hall with great slideshow presentations and graphic design work. He was very polished and thanked his beautiful wife, Esther Gutiérrez Sloan (2010 HOF inductee) for her support and inspiration. The Hall of Fame’s “Lifetime Achievement Award” was presented posthumously to the late, great Paul Bernstein, “Mr. Physical Fitness USA” (2009 HOF inductee) for his tireless dedication of sharing his fitness philosophy to the Nation for over 50 years. Bill Crawford (2012 HOF inductee) was very majestic in his introduction and Paul’s lovely wife Sandy accepted on behalf of Paul and children Robert, Eric and Heidi. The individuals who comprise the Hall of Fame Class of 2013 are well known, not only in the fitness community, but among the general public as well. It was nice to hear them thanking those persons who helped make their long careers so successful. The HOF Class of 2013 includes Tom Campanaro, Brenda Dykgraaf, Clyde Emrich and Anibal Lopez. Mark Rothstein (2011 HOF inductee) had the privilege of introducing both Anibal Lopez and Tom Campanaro. Anibal Lopez, professional trainer and multi-titled bodybuilder gave a very warm and heartfelt speech as he thanked his family and loved ones. Tom Campanaro, inventor and CEO of the Total Gym was very out-going and well spoken. Tom also thanked his family making special mention to his wife of 38 years, Joy and his mentor and friend, 92 y/o John Biaselli, as being crucial to his success. The ever stunning Cathe Friedrich (2011 HOF inductee) introduced the next inductee, Brenda Dkgraaf. Brenda, past fitness champion and television personality, brought glam and glitz to the stage as she humbly accepted this top honor. She sincerely thanked those present; her family and friends, especially her Mom & Dad, as well giving a shout-out to the many fans for supporting throughout the years. To really bring it home, Fred Schutz (2010 HOF inductee) introduced Clyde Emrich. Fred had the audience in stitches telling a few jokes that produced “gut-busting” laughs. As he brought Clyde up to the stage, you could tell that these two octogenarians had, not only mutual respect for each other but, admiration that only comes from a friendship of nearly 60 years. When Clyde spoke you could sense that you were part of a historic moment as he thanked his family, friends and who were with him on this special day. The 82 y/o past Olympian and long-time Chicago Bears strength training coach was inspiring to all. The sold-out crowd included many HOF notables including past inductee Frank Ruettiger (2012 HOF inductee), both Dr. Phil & Nancy Claussen (2009 HOF inductees), Del Reddy and Jim Whitehead (2010 & 2012 “Volunteers of the Year” respectively), Betty Scarimbolo (2009 “Rising Star of the Year”) as well as Superbowl Champion Chicago Bear, Tom Thayer and owner Brian McCaskey. Figarelli ended with the night by thanking everyone who was present for supporting The National Fitness Hall of Fame and its current Class of inductees and invited everyone back next year! Finally a special thanks to The American College of Sports Medicine (ASCM) for sponsoring this wonderful event and all the many volunteers, for without their help this event would not be possible.